GSE and FCC join forces again! | Girls S.E. Cincinnati Soccer Assn. Inc.
GSE and FCC join forces again! 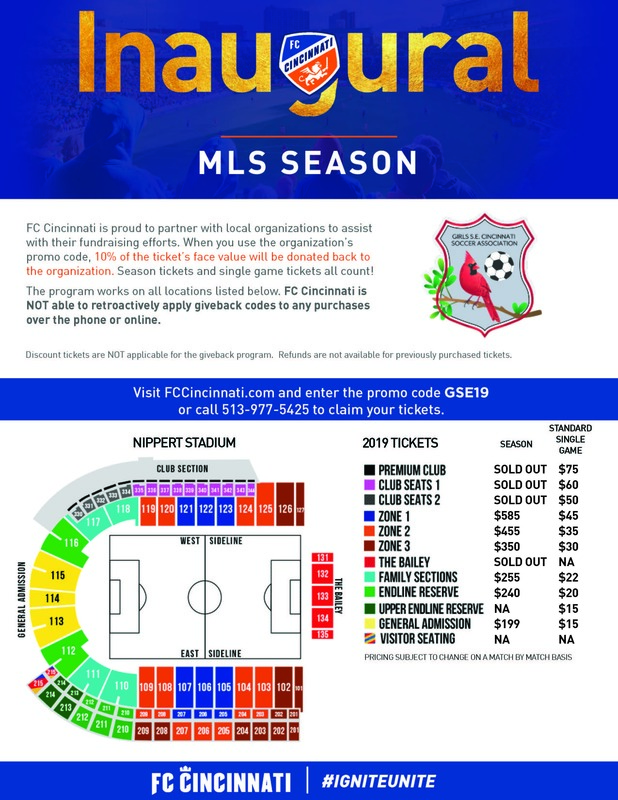 GSE Teams, coaches and families can now purchase tickets to watch our local team through the 2019 FCC's Youth Soccer Giveback Program. As part of our continued effort to expose our families to the wonderful game, GSE has just agreed to a new 1 year partnership with FC Cincinnati for the 2019 MLS season. The partnership allows our families, and their friends the opportunity to buy tickets and fundraise for the program without any additional cost or time commitment. Simply buy a ticket through their website or via the phone mentioning our PROMO CODE GSE19 and 10% of the sale comes back to the organization. This can also be used for season ticket orders. If you have already purchased tickets, give them a call and they will add the promotional code for you! We will also be hosting a GSE night at FCC in August. Tickets for this event will be at a discounted rate of $17 with our hope to have as many GSE teams and families attend as possible! Tickets for this event will go through our very own portal. More information on how to sign up and buy tickets below. GSE - FCC Portal coming soon.